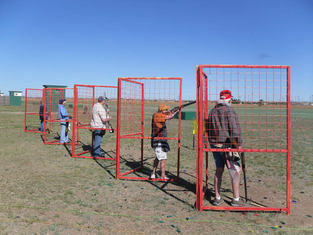 Five Stand targets are thrown from several traps with the same variety of targets as conventional Sporting Clays but the traps are set out over a smaller area. Squads of up to five shooters take up positions in fixed "five stands" (shooting positions) set out in a straight row. Each shooter will fire at a sequence of five targets from each of the five stands. After a shooter completes the first five target sequence he/she then moves to the next stand for the next five target sequence. Each complete rotation from a shooter's first Stand to his/her fifth Stand comprises a full round of 25 targets. Competitions are usually shot as multiples of 25 targets.